Ah, ice. 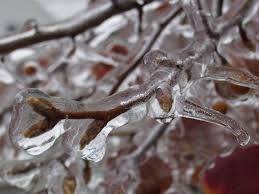 Yesterday I awoke to find my car and all the nearby trees covered in it, due to a recent minor bout of freezing rain. Well, it was minor in London, Ontario. Apparently it was a bit more serious in other places. This event reminds me of the Great Quebec Ice Storm of 1998, which I was lucky enough to participate in from the comfort of my then-home in Ste-Anne-de-Bellevue. That home, conveniently, was on the same electrical circuit as a major hospital nearby. We lost power for maybe, oh, 45 minutes or less. In the middle of the night, while I was sleeping, so I didn't pay very close attention. Many people lost power for longer. Rumour has it that this resulted in a minor Quebec baby boom nine months later. I wouldn't know anything about human babies, but at the time me and ppatters were safely indoors, entirely with electricity, discussing and building the earliest beginnings of Weaver 1.0 and NetMap, and integrating it all with WvDial. I don't have too many terribly insightful things to say about those hazy days, except to observe that, hey, dialup really doesn't seem as popular now as it did then, does it? But dialup, and WvDial, were the things that sold the first bunch of weavers. Speaking of which, here's a quick timeline to remind me how slowly this all actually started: - Summer 1997: thought of the general idea. - Fall 1997 (+3mos): incorporated Worldvisions Computer Technology, Inc. Confusingly similar to a certain massive charity, but that didn't matter, because we're in a different industry. Heh heh. - Winter 1998 (+6mos): ice storm, working at General DataComm by day, coding on Weaver at night. - June 1998 (+1yr): first 5 weavers actually sold, but only because I wrote Tunnel Vision 1.0 the weekend before. (Side note: it's highly disturbing that tunnelv is still the second Google hit for "tunnel vision." Stop it already! OpenVPN is way better!) - Fall 1998 (+1.5yr): dcoombs and I take four months to work full time on Weaver 2.0 and to sell, sell, sell! with reasonably passable results, especially considering neither of us had ever sold anything before. - Early 1999 (+1.8yr): Licensed Weaver sales rights and tech support to sestabrooks & co. for a share of 50% of gross profits. They apparently sold quite a few of them. - Summer 1999 (+2.0yr): During a failed attempt to sell out to the now-defunct Netwinder people, licensed NetIntelligence 1.0 to them non-exclusively and, oddly, got hired to write their user manual. - Fall 1999 (+2.3yr): Met opapic and gmcclement and formed Net Integration Technologies, Inc., the replacement for Worldvisions. Made opapic the CEO, taking over leadership from me, to the benefit of all involved. - Sometime in 2000 (+2.5-3.0yr): First round of real financing. I forget exactly when. Opened an actual office. - June 2001 (+4yr): Hired mcote, the first developer other than me and dcoombs. - January 2002 (+4.5yr): opened the MontrealOffice for the first time. That's all for now. Off I go to meditate on the idea that we only had two part-time developers (ie. me and dcoombs) until about four years after the project's initial conception. And my new project is only about four months in. Historical expectation based on the above: we should have just chosen a name, incorporated, and now be moving at putting together the beginnings of our first product. Wow. Historical predictions are still scarily accurate. Why did it seem so fast at the time?